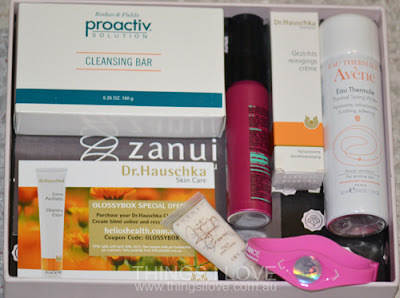 Now that beauty box offerings are no longer a new novelty in the Australian market, to really capture subscriber loyalty, the services need to continually bring out exciting boxes each month with unique offerings. 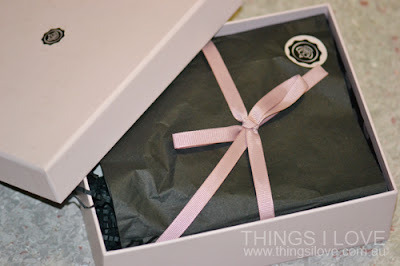 Last month (I know, a bit late but I figure I may as well post late rather than not), the March GlossyBox arrived in my mail. The beautifully packaged product had me excited from the get go. Did the contents inside stir me up just as much? Let’s take a look. 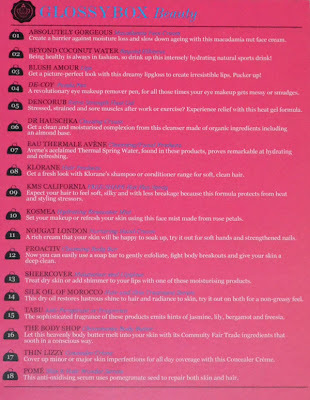 Glossy box has this month opted to for some variety and randomness by including 5 of 18 potential items as the contents of the box your receive – talk about luck dip! Dr. Hauschka cleansing cream (10g sample size) – I’ve previously used this cleanser and it delivers a foaming goodness and leaves skin soft and supple. Avene thermal spring water spray (50ml sample size) perfect size for the handbag actually. KMS FreeShape hot flex spray (30ml sample size) – although I love this product (reviewed here), I would barely get through a single use with such a small size (I have a lot of hair to get through)! Nougat hand cream in Fig & pink Cedar (sample size) - smells lovely and good for taking on holidays where space is precious and you don’t want to lug toiletries back home. There is also a pink power balance wrist band to encourage you to be active and improve their strength and flexibility. I’m yet to see any of those effects on me. And as extras, discount cards from Zanui, Dr. Hauschka and Panda Pen were thrown in for online purchases. Pretty packaging aside, I have to say was a little underwhelmed this month. Although I would, and could see myself using all the products (barring that power balance wristband), there was no wow factor in it for me, no colour makeup to bring a pop into my beauty box life. 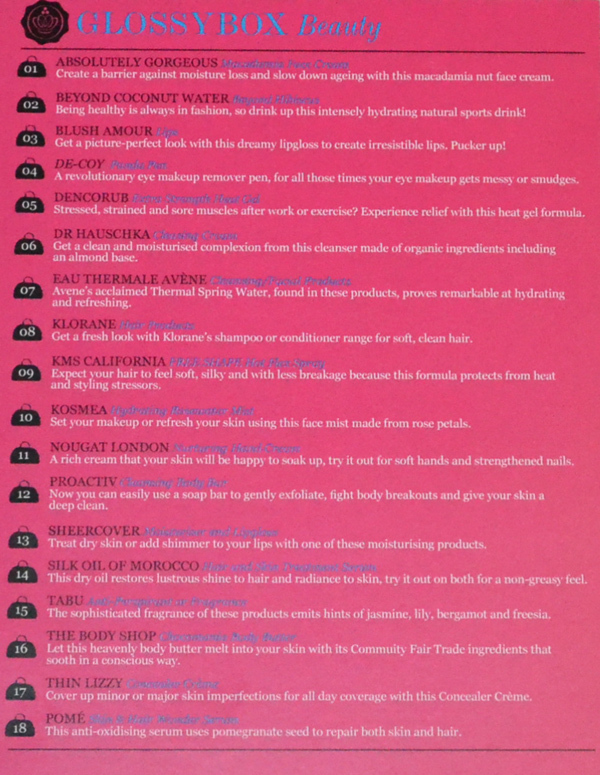 These are products I would buy if I was running low on my staples but I want products in my sample that allows me to be more experimental and I want to see things wouldn’t consider or have the opportunity to try – expectations much? It could also be the fact that I was served a skincare lucky dip box rather than one with makeup as I saw that lip glosses were on offer in other boxes (the list is still heavily skewed to hair and skincare products though). Hopefully, April's box will excite me a lot more. I have faith it will because life is full of surprises and one of them will eventually delight me. 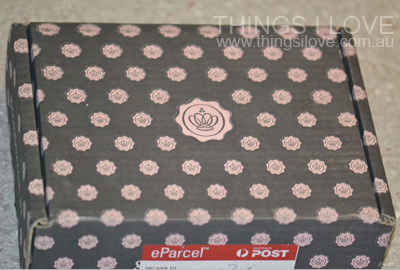 Glossybox and all other Australian beauty box subscriptions are A$14.95 each month delivered to your door. Sign up for one here.